We’d love your help. Let us know what’s wrong with this preview of Slingshots & Key Hooks by Geoffrey Fisher. To ask other readers questions about Slingshots & Key Hooks, please sign up. I absolutely adore this book. As a forager, nature lover and a homeschooling mother of five, this book on ways to use foraged (fallen) wood appeals to me on so many levels. It's absolutely delightful -- wonderful written with clear instructions and lots of photos. I'll be posting a detailed review with photos (and hopefully a finished project or two) on our family foraging/homesteading blog soon at http://magicalchildhood.com/life/. 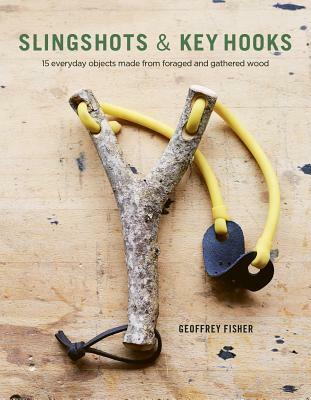 Slingshots & Key Hooks by Geoffrey Fisher is a free NetGalley ebook that I read in late February. Practical objects to make out of wood - it's all about making do, appreciation for wood (easy to do, since the trees and moss look greener than green), and using a mix of hand & electric tools. There's about one picture per paragraph-sized step. I particularly liked the magnetic hook, a ‘dibber’ (aka planting awl), and the ping pong paddles. I love how this book is so gently on the envioroment both in the the material salvage from nature and the tools used. the items made are very beautiful and useful, and very easy to make. There are pretty wooden plant markers, clothes hooks, skipping rope handles, whistle, cup and ball game as well as the slingshot. These items are beautifully made, far better than shop bought plastic, and cost only time, once you have the simple tools. For someone who would like something elegant for their homes, I love how this book is so gently on the envioroment both in the the material salvage from nature and the tools used. the items made are very beautiful and useful, and very easy to make. There are pretty wooden plant markers, clothes hooks, skipping rope handles, whistle, cup and ball game as well as the slingshot. This is an excellent book to teach anyone how to utilize what is around them. As a grandmother, I use it to teach my grandchildren about history and how to make the most of what is around us. We used slingshots growing up and my grandson has had a wonderful time using his. This would make an excellent gift for a father or grandfather. The instructions are clear and the results pretty much guaranteed.